Adults are approximately 64 cm long and weigh 800 g. They have a black crown and back with the remainder of the body white or grey, red eyes, and short yellow legs. They have pale grey wings and white under parts. Two or three long white plumes, erected in greeting and courtship displays, extend from the back of the head. The sexes are similar in appearance although the males are slightly larger. 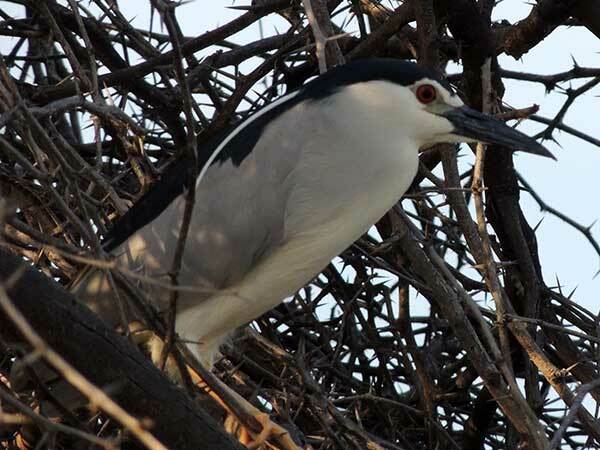 Black-crowned night herons do not fit the typical body form of the heron family. They are relatively stocky with shorter bills, legs, and necks than their more familiar cousins, the egrets and diurnal herons. Their resting posture is normally somewhat hunched but when hunting they extend their necks and look more like other wading birds. Immature birds have dull grey-brown plumage on their heads, wings, and backs, with numerous pale spots. Their underparts are paler and streaked with brown.